I am so very proud to introduce you to Trinity Stamps, a new company by my friend Taniesa! I met Taniesa a few years back at the Ellen Hutson warehouse and was instantly struck by what a sweet & genuine person she is. I am so excited to see her realize this dream and I'm also so excited to start collecting all her adorable stamps!!! 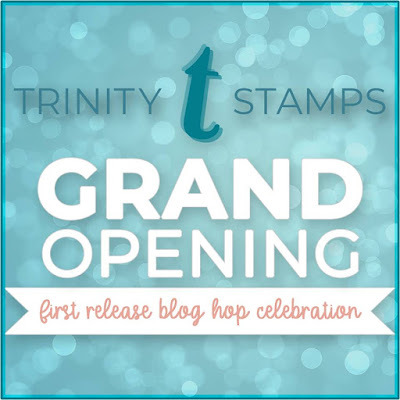 To celebrate the Trinity Stamps grand opening, we are having a hop & there are prizes! Head over to the Trinity blog if you get lost along the hop and to learn more about prizes! I still consider myself a Copic newbie so any practice is a good thing! I love a good ink blended background! 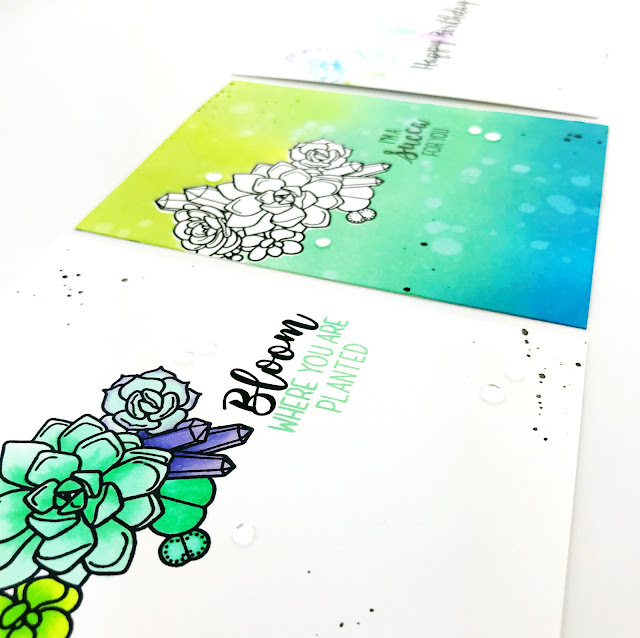 To create this card, I stamped the succulents in black and then covered with a mask before blending the Distress Oxides on top. Any watercolor markers would work well for this technique but I do love my Distress colors! To create this dreamy, watercolor look just use markers to color directly on stamps, mist with water & stamp! After creating all my backgrounds, I added sentiments, black splatter and sequins to create cards. And here is a video of a quick trick I use for adding sentiments to backgrounds without messing them up! Make sure to check out the rest of the Trinity Stamps first release because it's gorgeous! And keep hopping with us onto Jo Ann's blog! Lovely cards using these new stamps, Carly. I love the succulents. Fabulous use of Distress inks. Your cards are stunning. Carly, these are beautiful...gorgeous color palette. Beautiful cards, I love the different ways you used the stamp. Wow - love your cards and the wonderful ways you've used that darling set! Beautiful cards, love the history of the company! TFS. Beautiful cards! I love the distress inks! Lovely cards and stamp set. Beautiful cards. I love your color choices, all my favorites/most used! I like the way you used different treatments with the same stamp set. All beautiful cards. Gorgeous colours of your cards. Love them! Beautiful! Great layout tip also! Thanks. I absolutely LOVE your cards (and your awesome video tip clip!). You are so sweet and you made our Grand Opening even more GRAND with your talent!!!! Big Crafty Hugs!!! Thank you so much! What a great idea to try different backgrounds!! They are all lovely and this stamp set is fabulous!! I love succulents 💗 I especially love the interesting look of the Distress markets! Gorgeous cards!! Love the pretty background and stamp sets used! Love all three backgrounds! The cards are gorgeous! Very pretty colors! The backgrounds are perfect. Love the stamp set and your cards! The colors are so pretty, reminds me that I need to use my distress pens more! So gorgeous - the colors are so deep and pretty! Great designs too! Love the colors of your beautiful card. 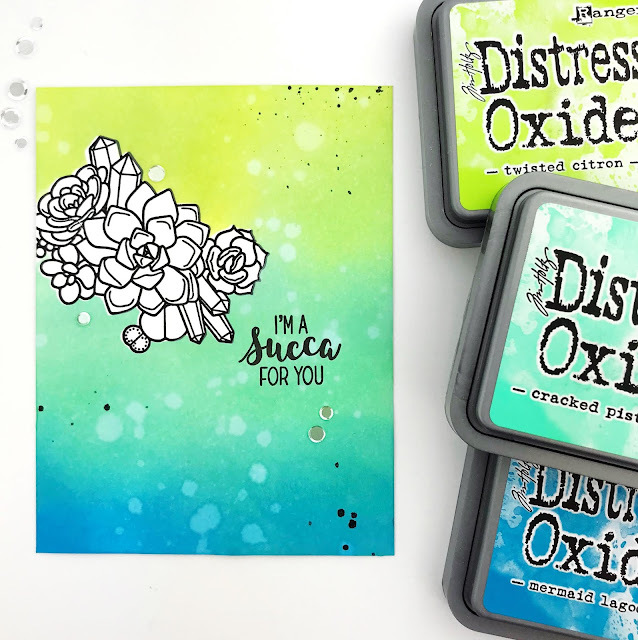 I really like the color combo on the distress oxide card! I'm looking forward to seeing what this new company has to offer! A lovely trio of cards!! Love the colors and these new stamps!! Love the succulents! Beautiful techniques! Ooo, I love seeing sets of cards like this; it really is amazing what you can do with a single layout! And I love how you kept a similar color palette across all your cards. I'm always looking for fun ways to do sets of cards for gifts, and I think this would work really well. Thanks for sharing with us! I love your creative process, plus it means more playing with my supplies. I love succulents, have a huge garden full of them. So glad more companies are making stamps. But Trinity added crystals too! First set I'm grabbing. Thanks for sharing your ideas! Pretty set of cards with these backgrounds and stamps. Thanks for the tip in the video too. Love the color palette...it works so well with the stamp sets...beautiful job! Great cards and I love the colors. Theses flowers are so pretty. Adorable cards! I love the colors you chose. Love the oxide ink background with white images. Great look! Great cards! I especially like the one you colored with Copics. The image is so beautiful in the teals and purples! Thanks for the tip on lining up sentiments. I love succulent stamps and creating with them! Your cards are so inspiring! Beautiful techniques! Fantastic cards! What an awesome idea to play with backgrounds using the same layout and images. Lovely cards and wonderful tip. Thank you for sharing. Great cards. I especially love the watercolor with the distress markers. Love the succulents set and your cards! Oh wow ! That’s a gorgeous trio of cards !! And a pretty interesting exercise. 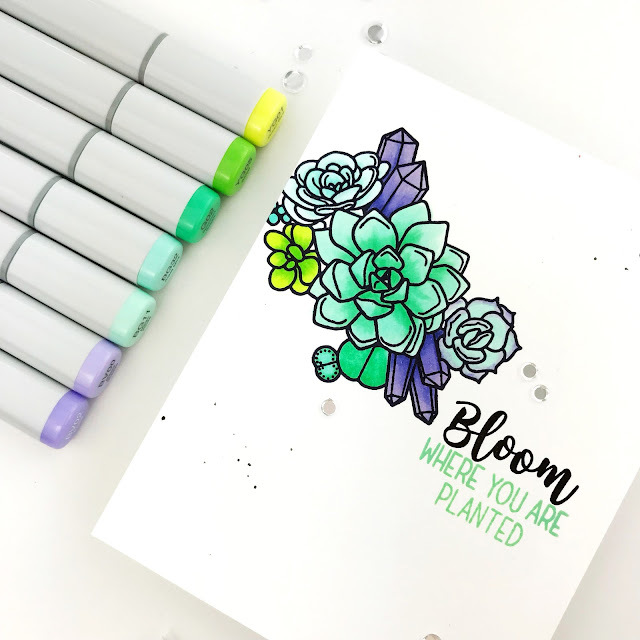 Pretty succulent cards and what a brilliant idea for playing in the craft room - practice with various color mediums and a stamp set! Thank you for your inspiration and sharing your amazing talents. Cute stamps, love it with distress oxides. I love the beautiful, rich color in our cards! Each one looks amazing! Can't wait to see more! Amazing colors!! You’ve inspired me to buy more floral stamps for my collection. I love all 3. So beautiful. I like this stamp very much. This set is really nice! Great job! I love how you used different techniques with one stamp. Shows how versatile the stamp is. Love how you showed three different mediums with the same stamp. Great cards! Very cool to see three different ways of highlighting a stamp!! Lovely art work here - so happy for you to display their new products - have a blessed day! Pretty cards! Love all three versions! 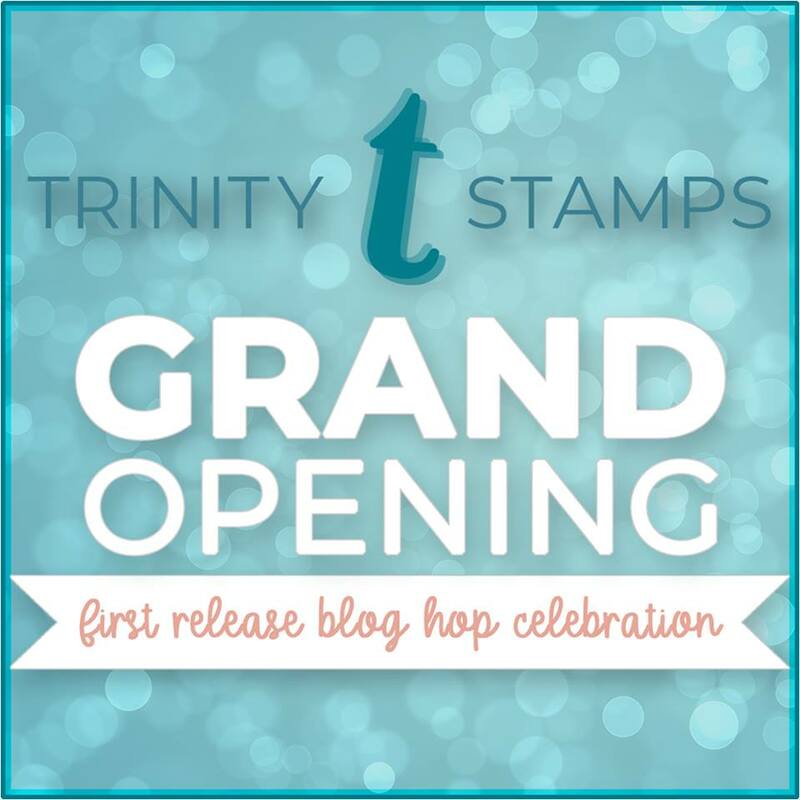 Congrats to Trinity Stamps on their grand opening! Great color combo for these great stamps. Love the distress oxide card!! Sweet!! Love the fun design and vibrant colors. Hi Carly. This is my first time to your site and I love your style. Adorable cards! You've shared a lovely range of cards today. Thanks for the inspiration. Ah! Love that you did different techniques with the same colors! Awesome cards and colouring! Love your techniques!!! Thanks for the tip and the card examples. I need to pull out the markers and do that one again. It' the first stamp technique I ever shared with my grandgirls, and we had so much fun that day. They are bigger now, and (shhhhhh, this is a secret) they are getting their own die-cutting machine this year so they can keep making cards. Thanks again. One of the things I am loving about my sort-of new hobbie is that you CAN do things lots of different ways. 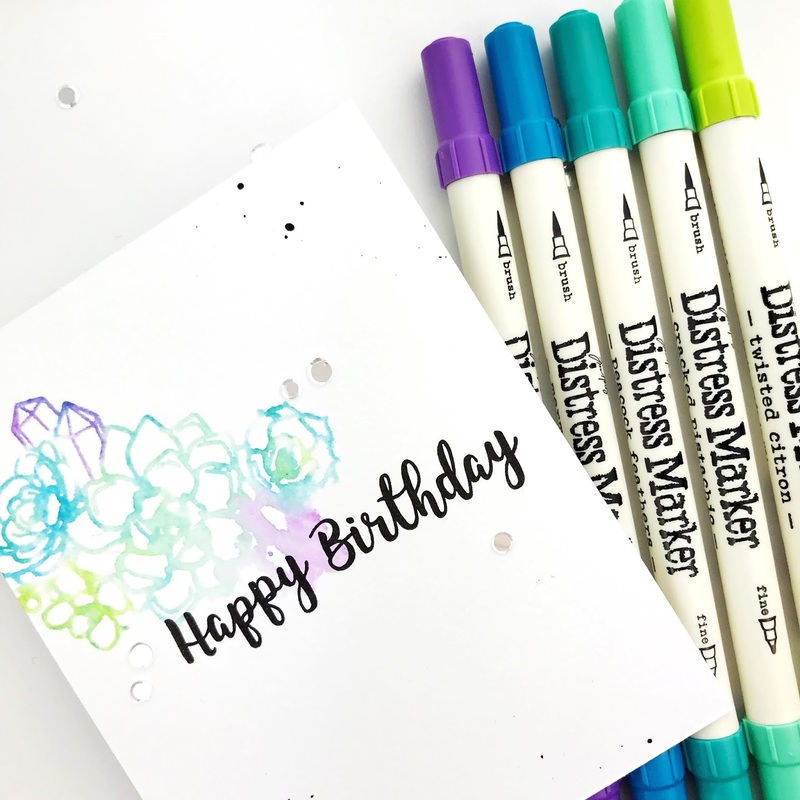 sweet birthday wishes card + crafty sale!